So here we begin! 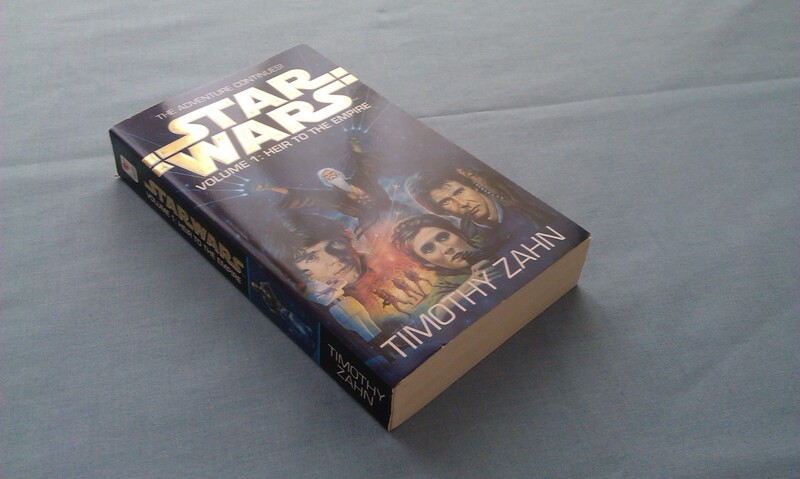 This morning I finished reading Heir to the Empire by Timothy Zahn, arguably the best book ever written to carry the Star Wars logo, and certainly in my top five favourite books of all time. Without a trace of hyperbole, this book quite dramatically changed my life. I have already talked about how I discovered it in the school library all those years ago, of course, but having now re-read it again I feel that I need to devote one blog to each of the three installments. I realise these blogs might begin to sound a bit weird, but I don’t really care. This book is just awesome, I cannot emphasize that enough. But let me tell you why. In the late 1980s, Star Wars was, to be blunt, pretty much dead. The film series had ended in 1983, and aside from West End Games publishing RPG material, there was precious little reason to think anything other than Star Wars was finished. I mean, role-playing games were confined to spotty kids playing in basements, if the stereotype is to be believed. But then, the unthinkable happened. A novel was published that continued the story of Han, Luke and Leia post-Return of the Jedi, and it went straight to the top of the New York Times Bestsellers. With a demonstrable desire for further stories set in the galaxy far, far away, the 90s were launched with a whole new purpose! Sounds good, doesn’t it? Well, it pretty much happened like that, anyway. Zahn wrote the trilogy at one of the lowest ebbs of the saga, when the small group of fans who had been subsisting on VHS copies of the films were desperate for more. So while you might be tempted to think the Thrawn trilogy was just a case of right place, right time, to do so would be a massive underestimation. For me, the reason why the trilogy is so awesome is that is is just so believable. I mean, as much as sci-fi/fantasy ever is. The characters that we saw on the screen are so believably written, from the big three down to the bit players like Mon Mothma and Wedge Antilles, according to Zahn because he used to have audiotapes of the films on in the car when on long journeys to distract his son, which gave him an innate feel for the speech patterns of the characters. But where his skill lies most obviously, for me, is the effortless way he weaves his own characters into the mix, to make you feel like you know them as well as anyone who actually had screen time. Mara Jade, Talon Karrde, and Grand Admiral Thrawn are all written so absolutely convincingly that they are names that loom large in Star Wars mythology, no matter what Disney is going to try to convince us is the ‘official’ history. Heir to the Empire is set five years after the Battle of Endor, where the Empire’s territory has been shrinking in the face of the Rebel Alliance, now installed as the New Republic with Mon Mothma as the first chancellor. Leia and Han are married, and Leia is pregnant. Luke is still a bit uneasy with the idea of being the last of the Jedi, though as Ben’s ghost tells him as the book opens, he is the first of the new order of Jedi knights. The weight of having to train both his sister and eventually her children is heavy upon him as he worries about failing them as Ben admitted he had failed Anakin Skywalker. All of this leads to a Luke who is pretty depressed for most of the book, something that bugged me when I first read it. But then, on reflection, I feel now that it is perfectly reasonable. Luke is always somewhat a part of and apart from the ensemble cast in the films. At the end of RotJ, where did we all think the heroes were going next? Han and Leia were pretty obviously going to have a wonderful life together making babies, but Luke has done his job by redeeming Vader and bringing about the end of the Empire. Being such a massive part of galactic history is bound to weigh heavily on you, if all you’d been brought up to do was moisture farming. Into this happy world, though, the Empire is once again making waves. There is a sense, right from the beginning, that Zahn is very conscious of the history of the universe he is writing in, and we get a real feeling that this is a real place, where the characters don’t exist in a vacuum but know about stuff that happened years ago. But while there is perhaps an over-reliance on characters remembering their movie lives only, there is nevertheless a scope here, a depth that the movies themselves had. That bounty hunter on Ord Mantell? That manoeuvre at the Battle of Taanab? There are similar references all over the place here, and it continues throughout the trilogy. I also really like the fact that the rebellion years are referred to as “the war” throughout the novel. It’s something that we would do in real life, after all. The best example, however, has got to be the Clone Wars. What was essentially a throwaway line by Luke in A New Hope that served little other than to fill in some expositional back story, the Clone Wars are obviously a very real galactic event, with their repercussions being felt still. Remember, though, that this was all written before the prequels, so Zahn’s interpretation is technically incorrect in light of subsequent media. As a Star Wars fan, though, I find myself increasingly wanting to separate the timeline in two, so that we have stuff like the Bantam era novels, all of which only have the original three films (and, as time goes on, each other) to rely on, and everything that has been released since 1999. At least this way I don’t need to worry about irregularities like this. I’ll probably talk more about this when I get to The Last Command, anyway. Suffice it to say, there is a real scope here that I like a lot. The new characters that Zahn created for the trilogy are the best points of the books for me, though. I’ll start with the trilogy’s eponymous villain, Grand Admiral Thrawn, the mysterious alien commander of the Empire’s forces. West End Games are responsible for a lot of the ‘facts’ about Star Wars, some of them a bit bizarre, but nevertheless they worked hard to explain pretty much everything we see in the films. A case in point is the fact that all of the Imperials are exclusively human men – well, this is because the Emperor had a well-known anti-alien bias, naturally, giving him the dimensions of a Hitler. 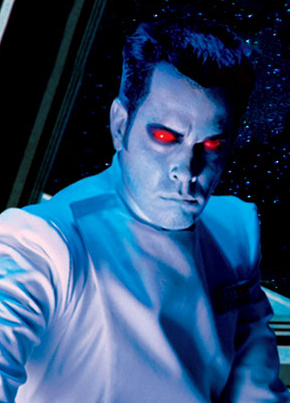 However, Thrawn, with his pale blue skin and his glowing red eyes, is a curious exception – that he achieved the rank of Grand Admiral is nothing short of amazing. What was it that prompted the Emperor to make such an exception? Well, throughout Zahn’s work in the Star Wars universe, we learn all sorts of things about Thrawn, culminating in his novel Vision of the Future, where we learn almost all of his backstory. Zahn has got a way with portraying the criminal underworld of the Star Wars universe, as seen in his most recent novel for the saga, Scoundrels. Throughout the trilogy, we’re introduced to some really excellent, diverse smuggler groups, the most important of which is Talon Karrde’s organisation. Said to have taken over as the biggest group following Jabba the Hutt’s demise, Karrde’s smugglers are an eclectic bunch, most of whom are convincingly portrayed so as to be as believable as any of the main group. Karrde’s lieutenant is Mara Jade, who is quite literally the most important non-movie character in the entire Star Wars saga. From the off, she’s an interesting character, and throughout the book we get increasing hints as to her backstory, culminating in her explanation to Luke in the depths of the Myrkr forest. The Emperor’s private assassin is perhaps too good an opportunity to pass up on, and so she has been peppered into books throughout the 1990s, until eventually she and Luke get married in the pages of the comic Union. However, that’s all a long way in the future. For the bulk of the trilogy, Mara hates the big three for ruining her privileged position in the Imperial court, but she hates Luke most of all, as she believes he killed the Emperor. Her final command from her master was to kill Luke at Jabba’s palace, but she failed when Jabba sentenced Luke to die at the sarlacc pit. Having pieced her life together following the Emperor’s death at Endor, she has made it to Karrde’s right-hand-woman, when once again Luke Skywalker falls into her life and threatens to turn it upside-down. The secondary characters he has added to the pantheon, such as Winter, Borsk Fey’lya, Joruus C’baoth and Captain Pellaeon, are all similarly handled excellently. Winter feels like she really is Leia’s childhood friend from Alderaan, and I was so convinced by Fey’lya that I had to rewatch the Alliance briefing scene in RotJ to see if the furry little Bothan was indeed there! It’s all just wonderful! A synopsis can’t really do this awesome story justice, as the breadth of detail is just so rich, but I’ll give it a go. So, the Empire is making a renewed stab at the Rebellion under the leadership of Grand Admiral Thrawn. Part of his plan requires the use of some technology the Emperor squirreled away on a planet called Wayland, along with the services of the dark Jedi who has been guarding this storehouse. Thrawn recruits Joruus C’baoth, who we learn is the unstable clone of a long-dead Jedi Master, to co-ordinate his battles through the Force. In return, Thrawn promises C’baoth he will deliver Leia Organa Solo and her unborn Jedi twins. For this task, he recruits his Noghri assassins, an alien race personally loyal to the Grand Admiral. 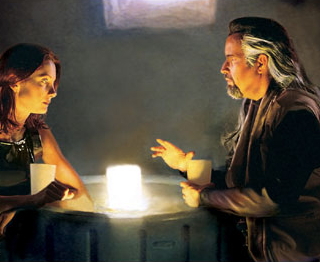 At a diplomatic meeting on the planet Bimmisaari, the Noghri make their first move but, due to quick thinking and luck, Luke, Han and Leia manage to escape. The next attempt, on the planet Bpfassh, nearly succeeds, but at the last minute the heroes manage to escape once more. Luke, concerned with the responsibility of training the next generation of Jedi, heads back to Dagobah on a hunch, and while there has a haunting vision of failure at the Pit of Carkoon. He also discovers a battered piece of technology that Artoo allegedly saw Lando use on Cloud City, so determines to visit his old friend at Nkllon. Han, concerned about the commando attacks, decides to find somewhere to hole Leia up, but in order to keep in touch with galactic events they need a slicer to tap into the fledgling New Republic comm channels. He also heads to Nkllon and Lando, and in the brief reunion for the heroes, the Empire strikes, stealing fifty of Lando’s mole miners for purposes unknown. During the course of this incursion, Luke feels the presence of C’baoth, and the rumour that a Jedi has appeared on the backworld of Jomark prompts him to look into the matter. Leia and Chewbacca decide to head to the Wookiee homeworld of Kashyyyk while Han and Lando look into getting a slicer from Talon Karrde’s smuggling organisation. Luke, on his way to Jomark, is ambushed by the Imperials, as Thrawn wants to prevent him distracting C’baoth at this time. Luke manages to escape, but his X-Wing is crippled in the effort. He’s picked up by Karrde and taken as something of a prisoner to the planet Myrkr, where he is cut off from the Force due to the indigenous creatures, ysalmiri, who create bubbles in the Force as a natural camouflage. Karrde expressly doesn’t want to be involved in the Imperial-Republic conflict, but Luke’s presence is the stumbling block that draws him in. On Kashyyyk, Leia is attacked again, however, one of the Noghri commandos recognises her as the daughter of Darth Vader and refuses to kidnap her. During questioning later, it transpires that, following a space battle above the Noghri homeworld, a chemical contamination killed the world and would have doomed the species, had not Vader arrived and helped them rebuild. In return, the Noghri have served the Empire ever since. Leia arranges to go to the world with the commando Khabarakh, in an attempt to bring the Noghri out of the Empire’s pall. Han and Lando manage to meet with Karrde on Myrkr, shortly before the Imperials arrive to collect more ysalmiri. During the confusion Luke tries to escape, but is pursued by Karrde’s lieutenant Mara Jade, who is openly hostile to him. Both ships crash in the forest and the two have to work together to make it back to civilization, during which time Mara explains her Imperial past and her last command from the Emperor. However, despite multiple opportunities, she doesn’t follow through. Han and Lando, learning that Luke had been held as a prisoner by Karrde, head off to rescue him from the Imperials left as a rearguard. They succeed, but their actions don’t go unnoticed by Thrawn. The book – indeed, the entire trilogy – has so much to commend it, I can’t begin to tell you how much I love it! Though I’ve made something of an effort with this blog… Well, anyway, the only thing I can tell you is that it is awesome, and you should go ahead and buy it right now. Put all other commitments on hold, and read it. Once you’ve read it, read the second and third installments, and then sit back and bask in perhaps the most productive way you have ever spent your time! This trilogy IS episodes VII, VIII and IX for me, and I’m sure it’s the same for many fans around the globe. I don’t mean to be down on Disney all the time, but faced with a novel trilogy of this magnitude, I would say they have no hope in producing anything that would be more compelling, more entertaining, and more fabulous than this. So what are your thoughts? Do you also love Heir to the Empire, and all of Zahn’s greatness? Or do you prefer the Jedi Academy trilogy? Let me know in the comments! Next Next post: More horror!